It’s been a terrific year of NEC hoops from my vantage point, one that culminated with the tandem of Darnell Edge, Romone Saunders, Sean Hoehn and Mike Holloway making the league extremely proud. The senior foursome reached the semifinals of the 3 on 3 national championship in Minneapolis, finishing with 4 victories and earning a collective $2,000. To finish fourth overall among a 32-team crowd – defeating the Atlantic 10 and SEC in the process – was quite impressive given the roster’s effective height and stiff competition they were facing. Watching the seniors make plays in the open floor and assume roles – Saunders as the playmaker, Hoehn and Edge as the heady shooters and Holloway as the paint presence keen on setting up his teammates – got me thinking about the NEC’s best from the past season. It made me want to hand out my unofficial awards throughout the league, because why not? Romone Saunders, Wagner – If you watched any of the 3 on 3 national tournament, you’d know Saunders was difficult to contain. In the NEC’s first two victories in Pool C over the Big West and Atlantic 10, the graduate senior made 9 of 19 (47.4%) from behind the arc. When he’s on a roll like that, good luck and God speed, as it’s going to be a long night. Throughout the real season, Saunders size, strength and offensive instincts made him one of the most difficult players to contain. His game winner at the Mount in February perfectly encapsulates his “bull in the china shop” type of game when he’s heading downhill toward the basket. Raiquan Clark, LIU Brooklyn – Everyone knows Clark is driving to the basket, but the thing is, he’s still impossible to stop. His 201 free throw attempts led the league by a mile. He took 71% of his shots near the rim, according to Hoop Math, and still made 59.2% of those attempts. Currently, Clark is petitioning the NCAA for a fifth year as he only played one game as a walk-on freshman under Jack Perri. If he’s granted the extra season of eligibility, NEC coaches will be groaning at the thought of containing Clark once again. Matty McConnell, Robert Morris – This was easy, as no one exhibited the fire and drive that McConnell showcased for 30+ games in a Colonials uniform. There are some who believe he was most deserving of the league’s Defensive Player of the Year award, and yet, it was McConnell’s maturation on the offensive end that help mold him into one of the most respected players the league has seen in recent memory. As a senior he posted career highs in KenPom offensive rating (105.5), free throw rate (35.6% FTA/FGA) and 3-point percentage (34.0%), while anchoring a Colonial defense that led the league in efficiency. He’ll be missed in Moon Township. 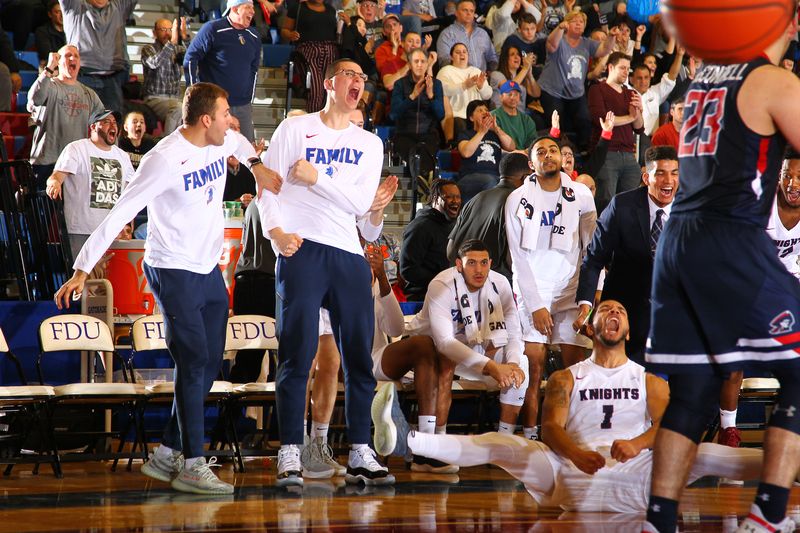 Jamaal King, Saint Francis – King’s competitiveness was a sight to behold, even if Rob Krimmel at times tried to rein in his talented guard’s on-the-court fire. From a fan’s perspective, however, King cared deeply about his program and how the Red Flash performed by wearing his emotions on his sleeve. Keith Braxton, Saint Francis University – There really isn’t much else to say about Braxton, because it’s already been said on numerous occasions (I especially like Ron Ratner’s write-up here), now that the junior has a NEC Player of the Year trophy to flaunt. His innate ability to impact the game without dominating the ball it is a special trait that few possess. Tyler Kohl, Central Connecticut – In Kohl’s first game as a junior at Hartford, then ESPN broadcaster referred to Kohl as “the old man at the YMCA.” Trust me, that’s a complement, as Kohl’s ability create opportunities for himself and his teammates, grab rebounds, and effectively freelance on defense made him a complete player. Sean Hoehn, Sacred Heart – Hoehn’s assortment of stutter steps, pump fakes and hesitation dribbles also peg him as a future champ at the Y, when a 55-year-old version of himself is schooling high school and college players in rec leagues. In all seriousness though, the senior guard had a wonderful final season, improving exponentially from Cane Broome/Quincy McKnight sidekick to a full-fledged top 5 NEC player and demonstrated leader. Only a player who has worked extremely hard evolving his game could exhibit that kind of improvement. It’s been a great template for the Sacred Heart freshmen guards to follow in their future seasons. Darnell Edge, Fairleigh Dickinson – There wasn’t anyone better from long distance than Edge, who shot an obscene 54.2% in the final season against NEC competition. A former free throw percentage champion who’s made 91.8% of his freebies on 268 career attempts (just stop and think about that for a second), Edge led all NEC guards with an effective field goal percentage of 58.1%. He’ll go down as one of the most accurate shooters in league history. Mike Holloway, Fairleigh Dickinson – I know, I’m heavy on the seniors from the 3 on 3 national tournament team, but you simply can’t overlook the fact that Holloway lead the ENTIRE tournament field with 14 assists. For the big man to embrace his role as a facilitator surrounded by long distance savants speaks to Holloway’s unselfishness. Also telling is the fact that Holloway consistently deferred to his teammates over the course of FDU’s season, posting very good numbers (12.3 ppg, 5.7 rpg, 51.0% FG), but statistics that he easily could have beefed up if he was more selfish with the ball. More or less, Morse stacks up against some fantastic guards, considering that the other players mentioned above had far more experience around them compared to Morse. 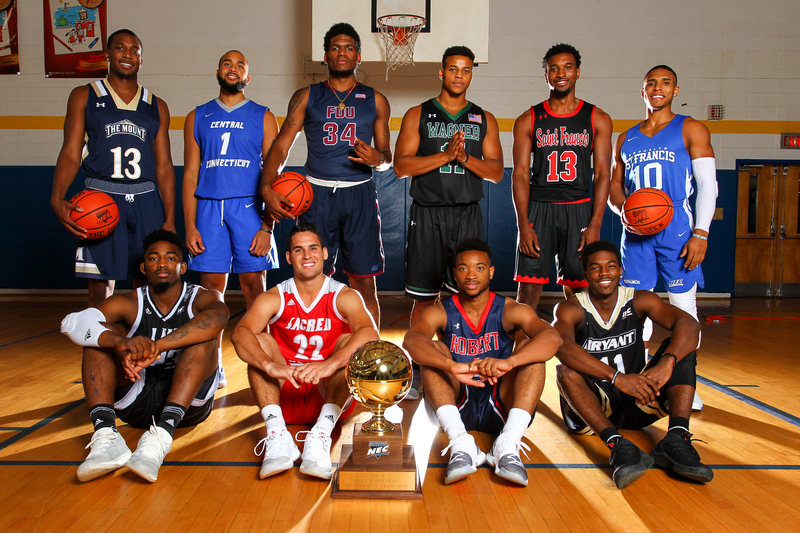 Case in point: Wiggins had a pair of NEC top 10 players in Julian Norfleet and Rashad Whack flanking him, Reed was next to Lucky Jones and Rodney Pryor and Broome had an elite facilitator in Phil Gaetano setting him up. This makes Morse’s past season accomplishments all the more exceptional surrounded by one of the youngest teams in the nation. He’s easily a NEC top 10 playing entering his sophomore season. I’ll leave you with a little prognostication into what the NEC Preseason First Team might look like come October. I think 3 of these names are locks to appear on the list with the final spot or two up for grabs. We’ll see! Jahlil Jenkins, FDU – If the coaches leave Jenkins off the preseason first team after his omission from an all-conference team for the 2018-19 season, then I give up. Keith Braxton, SFU – Well, of course. E.J. Anosike, Sacred Heart – For those of you who didn’t follow the league five years ago, Anosike has a similar game to NEC great Jalen Cannon. That tells you the path Anosike is heading toward: greatness. Raiquan Clark, LIU Brooklyn – I’m assuming he’s granted another year of eligibility and therefore making Derek Kellogg’s third year a lot less stressful. Jalen Jordan, St. Francis Brooklyn – This was a tough call between Jordan and Isaiah Blackmon. Also Adam Grant and Bash Townes may be deserving. Enjoy the offseason and I’ll talk to you along the way! Tuesday night marked a magical night for the NEC. Three teams were in action, and all three played well, representing the league as best as anyone could have imagined going into the night. Please allow me to offer my thoughts on the action, starting with the biggest win in FDU’s history. Fairleigh Dickinson started their first NCAA tournament game since 2016 with 9 turnovers versus 2 field goals. The Prairie View Panthers, the SWAC champions, came out on fire, hitting 10 of their first 14 shots from behind the arc. Even the team’s starting 6’7″ forward, Devonte Patterson, made 3 of 5 from way downtown after going 10 of 58 (17.2%) from 3 for the season. The Panthers’ quickness was bothering the Knights, bottling up passing lanes and preventing Jenkins and others from dribble penetrating to create. They came into the night sixth in the country in defensive turnover rate, and their early extractions only bolstered their case. In other words, it didn’t seem to be Fairleigh Dickinson’s night. Trailing by double figures early in the second half must have felt like a 20-point deficit, but then Greg Herenda’s offense started to settle down like they did over the final eight minutes of the first half. And they are doing this all with a 6-man rotation! After an ominous start to the second stanza, Jahlil Jenkins took over. Despite misfiring on his first two shots of the half, Jenkins dazzled to convert 8 of his final 10 field goal attempts, en route to a scorching hot 20-point, 4-assist and 2-rebound performance in what amounted to be 19-plus breathtaking minutes. 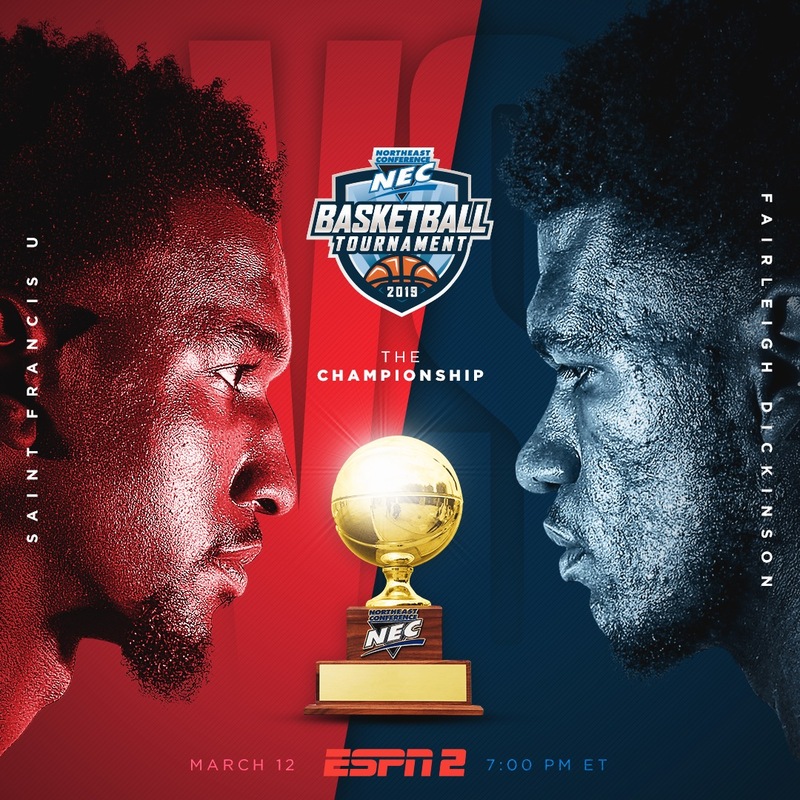 The Panthers did an admirable job stymying the lightning quick floor general in the early going, but like he did in the second half of the NEC semifinals, Jenkins’ will and elite agility got the best of the opposition. Fairleigh Dickinson trailed by 13 in the 2nd half. Enter Jahlil Jenkins! It comes as no surprise – the diminutive floor general was a winner in high school, leading Virginia Academy to a Division 3 state championship as a junior. It was a big reason why Herenda was recruiting Jenkins in the first place! Along with his partner in crime Edge, the duo combined for 55 points on 29 shots – quite efficient to say the least – while turning the ball over just four times in the game. The last statistic impresses when the ball was seemingly in both guards hands at every waking moment. Guard play wins big games, and the First Four opener in Dayton is living proof of that. While Edge’s play in the first half should be lauded for keeping the Knights in the game – his 18 points was more than the rest of his teammates combined (16) – the other senior was pivotal down the stretch. Mike Holloway had a difficult 25-plus minutes – he appeared to be pressing, unable to finish around the rim (2 of 6), catch the ball cleanly and find open teammates when Prairie View collapsed on him near the rim (5 turnovers). At one point, Reggie Miller even suggested on the nationally televised broadcast that FDU should stop giving Holloway the ball! The great 3-point shooter turned announcer hadn’t ever witnessed the senior’s resolve and heart, and knew little about the bruiser from Essex County, New Jersey. When it mattered most, Holloway buckled down and provided the Knights with the dominating interior presence the team was lacking throughout the contest. After committing 3 turnovers in the first four minutes of the second half, Holloway settled down to pour in 10 points, 6 rebounds and 3 blocks. The first rejection came at an opportune time, as Jenkins’ transition basket off the Holloway block was the start of a much-needed 14-3 spurt that gave FDU their first lead (61-59) of the contest. Overall, it was a terrific second half comeback, even if this story was written before in the NEC semifinal. It was deja vu in a way, with Edge and Jenkins willing the Knights and keeping the team’s magical season alive. Onto Utah to face the #1 seed Gonzaga! KenPom gives Fairleigh Dickinson a 1% chance to beat Gonzaga on Thursday evening (90-65). Hey, KenPom gave UMBC a 2.3% chance of beating Virginia, so you never know! It was supposed to be another ho-hum victory for the Indiana Hoosiers. Yes, they were part of the first four teams out of the NCAA tournament field, and thus their motivation would understandably be in question, right? But surely they’d make quick work of Saint Francis after demonstrating their dominance against programs from smaller leagues this season. 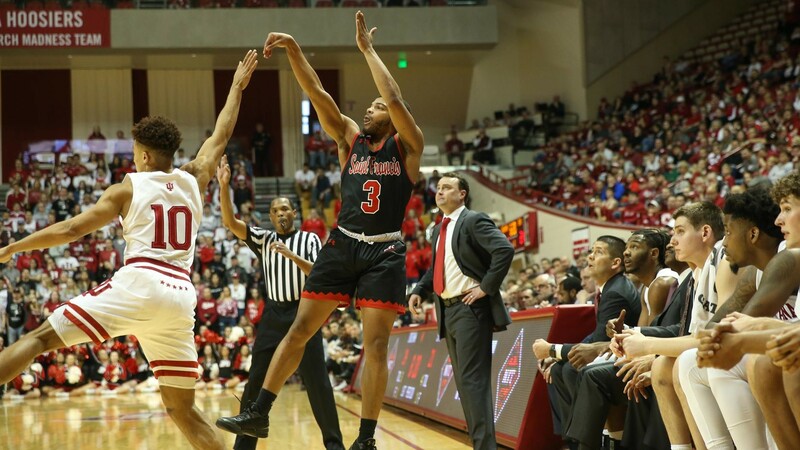 In six home games against mid-major competition in 2018-19, the Hoosiers won all six contests by an average of 31 points. Indiana needed to work harder that they anticipated for win number seven. The start was promising enough – a 14-0 run after falling behind 7-2 early seemed par for the course. The lead would extend to nine points, 22-13, before the Red Flash made their run, much of it having to do with the play of senior star Jamaal King. The 5’10” NEC all-conference first teamer was awesome in the first 20 minutes at Assembly Hall, registering 16 points on 9 shots to go along with 4 rebounds and 2 assists. His ability to make perimeter jumpers and convert at the stripe (4 of 4) was a big reason why Saint Francis held a surprising 6-point advantage at the half. Indiana came out swinging after the break, presumably in response to head coach Archie Miller’s stern lecture in the locker room. The Hoosiers went back to using their size advantage, outscoring the Red Flash 56-18 in the paint. They stopped settling for ill-advised 3s and they won going away. Despite the season ending setback, Saint Francis and King in particular have a lot to be proud of. The program’s NIT appearance is their first since 1958, back when that postseason tournament was the premier event in college basketball. For Rob Krimmel, this year’s NEC Coach of the Year, to turn Saint Francis into a league powerhouse is a remarkable accomplishment. And the head coach casts much of the credit to King. King finished his excellent career with 1,536 points, 391 assists, 290 rebounds and 138 steals. He, along with Andre Wolford and Luidgy Laporal, will be missed on a Red Flash roster that won its first NEC regular season championship since 1991. For Krimmel’s complete press conference, go here. His video begins at the 9:20 mark. The Colonials saved their best for last from an offensive standpoint, at least for the time being. Robert Morris scored a season high 98 points and 1.24 ppp against Division I competition in their CIT opening round victory on Tuesday night. The trio of Matty McConnell, Josh Williams and Jon Williams were sensational, combining for 83 of the team’s 98 points (84.7%). It wasn’t a consistent defensive effort by any stretch, but Andy Toole was pleased the team made the stops when needed, especially in overtime. The Colonials will live to see another day in the CIT, with their next matchup to be determined. In the meantime, the NEC gets to showcase St. Francis Brooklyn at the CIT on Thursday night, along with an exciting FDU matchup in Utah against Gonzaga. 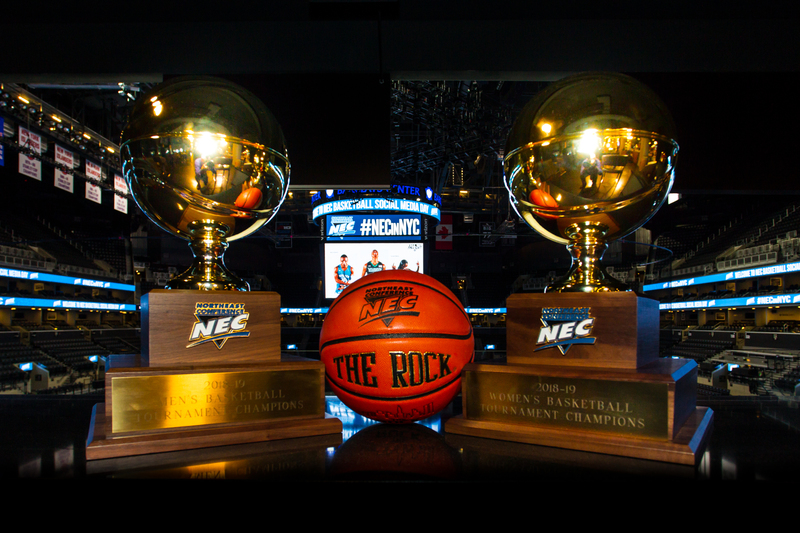 Enjoy the action, NEC postseason basketball in mid March: there’s nothing better! It wasn’t the most aesthetically pleasing first half at the Rothman Center, but the Northeast Conference had to be pleased with how the final 20 minutes turned out. Both programs were exerting maximum effort and making plays on both ends of the floor. There were five ties and six lead changes over the course of the game, much of that occurring in the second half. The gym was electric. It was, quite simply, March Madness at its finest. I was fortunate to be court side for the action, so please allow me to organize my thoughts in what turned out to be a great NEC tournament semifinal. The Robert Morris defense came as advertised, especially in the first half, holding the Knights to 1.00 point per possession and a bloated 32% turnover rate over 20 minutes. 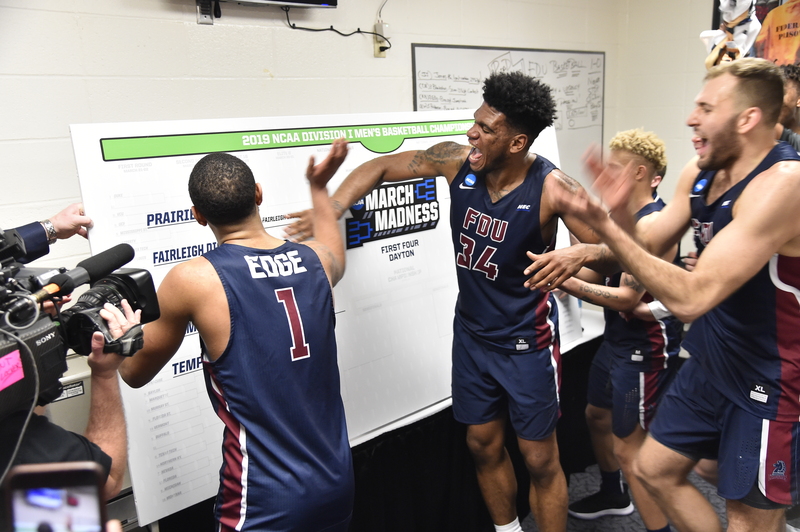 Their perimeter defense was fantastic throughout; the Colonials quick feet and fresh legs – Toole gave double-digit minutes to 8 players when it was all said and done – led to FDU settling for a series of contested perimeter jumpers. In the first half, the Colonials excelled in disrupting the Knights’ offensive flow and preventing their transition opportunities to a minimum. Not much changed from the Colonials effort and execution in the second frame, instead the Knight guards realized that creating scoring opportunities inside the arc was a must. 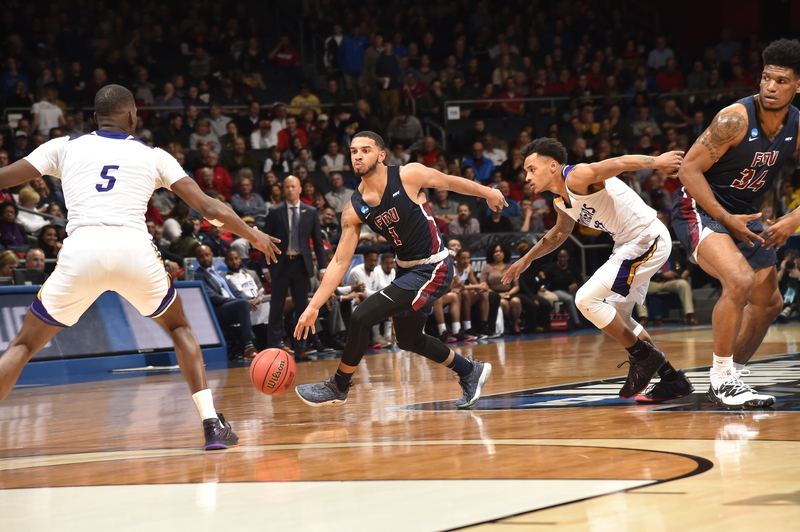 The philosophy didn’t pay dividends initially – Robert Morris held a daunting 10-point advantage midway through the second half, but the relentless drive of Darnell Edge and Jahlil Jenkins spurred Herenda’s offense when he needed it most. Edge’s inability to develop a rhythm behind the arc was the epitome of the Colonials defensive prowess – he made just one triple in his 38 minutes. Rather than continually camp out on the perimeter, however, Edge got creative and converted 7 of 8 from inside the arc for a game-high 20 points. Those points didn’t come the typical way Edge is accustomed to, but he got his buckets nonetheless. His seven 2s tied a season high, when the senior scored as many against Rutgers in the season opener back in November. He successfully adapted from perimeter sharpshooter to mid-range guru. It’s not the most efficient thing to take long 2s, but it was an absolute necessity given the Colonials game plan. 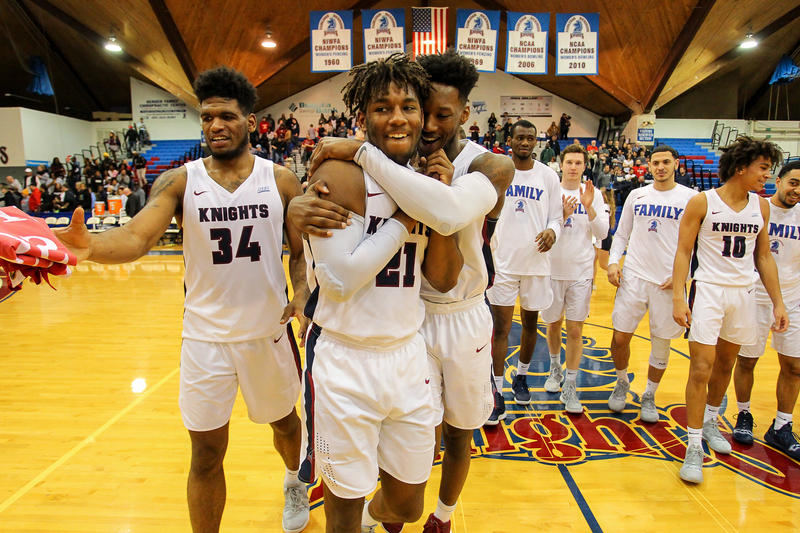 The Knights still registered a 57.9% effective field goal percentage for the game, but that surely was the hardest FDU had to work this season to score 66 points, their third lowest scoring output this season in games they were victorious. The Knights attempted only 15 3s, Mike Holloway was constantly bodied and fronted (mostly by Yannis Mendy and Malik Petteway) en route to just 4 shot attempts, and the Colonials patented “turn them over” defense was in full swing (28% turnover rate, 17 turnovers in 60 possessions). But Edge and Jenkins adapted their games in the second half, and it was a prime reason the Knights are travelling to Loretto for a Tuesday night championship showdown. Speaking of Jenkins…. The explosive Jenkins has been a model of efficiency as a sophomore – he was second in the NEC in assist to turnover ratio (2.2 to 1) and has been the main catalyst for why the Knights offense has run at a super efficient clip. But a quick gander at the semifinal box score tells a different story: the stoic floor general dished out just one dime against five turnovers. It was only the third time all season where Jenkins had 1 assist or fewer in a contest and the second time he committed five turnovers or more. That didn’t matter, as Jenkins morphed into a scoring point guard, because he had to. He found a way and did whatever it took to win. He willed the shorthanded Knights by running the point for 38 minutes and literally touched the ball on every offensive possession. Andy Toole is certainly cognizant of how difficult it was to contain Jenkins, even when they bottled up his passing lanes. Jenkins scored 18 points on 9 shots and got to the charity stripe 10 times, making 9. He was also disruptive on the defensive end, compiling 2 steals and getting out in transition a number of other times to give the Knights the best chance to score against a Robert Morris defense that couldn’t settle amid the tempo. By constantly being in motion and on the attack as a scorer, the Knights were able to survive. Jenkins relentless motor and ability to fly by defenders off the bounce is a marvel to watch. In the absence of Xzavier Malone-Key, the Knights bench got even shorter on Saturday. It was evident in the early going that Herenda was rolling with a 6-player rotation, for better or worse. Normally the shallow rotation isn’t an issue, nor has it been over the course of the Knights’ latest 12-2 stretch, yet Toole routinely employs an 8-player rotation, and today was no exception. Depth was a concern if you’re a FDU fan, but the play of freshman Brandon Powell was pivotal in helping quell those concerns throughout the contest. Especially since Kaleb Bishop found himself in foul trouble throughout the second half. The rookie played his best basketball in the most important game of his life – at least up to this point. He posted a season high 163 KenPom offensive rating with a 11-point (on 4 shots), 3-rebound and 1-assist showing. It wasn’t an eye-popping performance by any stretch, but Powell did more than enough to ease the burden of the missing Malone-Key, even on the defensive end. In addition to Powell’s contributions, Elyjah Williams effort in the second half should not go unnoticed. The energetic, versatile big led the team in cheerleading – he was imploring the crowd to make noise much of the time – and was a key contributor in the second half. After a quiet first half, Williams registered 4 points, 5 rebounds, 1 assist and 1 block in the second half. His two hustle offensive rebounds in the final minute of the game allowed FDU to secure a possession for 49 consecutive seconds (1:03 to 0:14) and led to two Jenkins FTs that extended the lead to 2 possessions. Fairleigh Dickinson has struggled to draw basketball crowds in the past, but their fans came out in impressive numbers for the 2 NEC tournament games this week. After finishing near the bottom of the league in terms of home attendance (482 fans per game) for 2018-19, the Rothman Center brought in 1190 and 1212 spectators, respectively, for the two playoff showdowns. Considering it is spring break on the Northern New Jersey campus, that’s a nice turnout for the #2 seed of the league. The atmosphere was electric throughout as there were several moments in the second half where the crowd noise was deafening. Well done, Knight (and Colonial) fans! NEC spirit was alive and well in Hackensack on Saturday. There haven’t been many four or five-year seniors who’ve stuck it out at Robert Morris over the past decade, but one player that’ll surely reside in program lure is Matty McConnell. The senior had himself a game on Saturday, collecting 17 points, 4 assists and 2 steals in defeat. A presumed finalist for NEC Defensive Player of the Year, McConnell embodied the hard-nosed, tenacious defensive effort taught to perfection by Toole. One notable fan and alum, Chris Cappella, poignantly paid his respects to No. 23 on Saturday afternoon. In the post game press conference, Toole was reflecting on McConnell’s impact, both this season and in seasons past. “I thought he played an excellent game today; thought he should’ve been the defensive player of the year in the Northeast Conference,” Toole said before continuing on. The senior guard finished with 1,102 points, 509 rebounds, 297 assists and 232 steals. March Madness has officially begun! For me, it honestly doesn’t get any better than watching four NEC tournament quarterfinals games on a weekday evening. The chaos that ensues for three hours is something to behold. As simplistic as that is – obviously the coach wasn’t about to share any of the hairy details for why his team shot so poorly – Anthony Latina likely felt the same way after the game last night. The Pioneers were hosting a NEC tournament quarterfinal for only the second time in nine seasons, and what unfortunately transpired was one of their worst shooting performances of the season. They converted a meager two triples out of 20 attempts after making 36.9% in 18 regular season games. Many of those misses were open looks, not necessary a product of LIU’s defense. The charity stripe was unkind to the Pioneers as well – they left eight points off the scoreboard after shooting 63.6% in the contest, a far cry from their league leading 79.3% mark versus NEC competition. There may be no explanation other than the moment was possibly a little too big for the second least experienced team in the NEC. On the flip side, a veteran LIU Brooklyn squad made the most of their opportunities from behind the arc, draining 11 of 24 (45.8%). These two programs share some recent history in the NEC tournament, as each were exactly in the same position three years ago, at least with respect to their seeding. Back then in the 3-seed/6-seed matchup, the hosting Pioneers watched role player Iverson Fleming torch them in the first half, finishing the playoff contest with 18 points on 7 shots. Fleming had as many 3s (3 for 3) in the game as Sacred Heart had combined (3 for 20). This time around was almost like deja vu for Latina. After making just two triples all season, Eral Penn made 3 of 5 from long distance. Jashaun Agosto, known far more for his ability to go downhill and attack the rim, made all three of his 3-point attempts. One of those buckets came at a critical time. With the shot clock winding down and the Blackbirds up three late, Agosto’s attempt at the top of the key found nothing but nylon, giving LIU a 2-possession cushion. As the old saying goes, guard play wins championships. In all, six of Derek Kellogg’s players hit a 3-pointer and their free throw shooting down the stretch was just enough to keep the charging Pioneers at bay. When you hold a 27-point advantage from 3 and shoot 14 percentage points better from the charity stripe, you’re winning most of the time. You can afford to lose the battle on the backboards (-6), score less points in the paint (-12) and commit more turnovers (-5) as long as you do one thing significantly better than your opponent. The Blackbirds made shots on the road, and they won. Sometimes, it’s as simple as that. The Knights came into the NEC tournament as one of the hottest teams in the league, winning 11 of their last 13. They won those 11 by an average of 10 points per victory. They shot a blistering 51.1% (214 of 418) on their 2s, 47.3% on their 3s (88 of 186) and dished out 165 assists against 131 turnovers for a splendid 1.26 A/TO on those victorious nights. Their offense had basically matched the program’s incredible level three years prior, when a core of Darian Anderson, Stephon Jiggetts, Marques Townes and Earl Potts lead the league in offensive efficiency. The high flying, shot-making, crisp passing Knights under Greg Herenda were back and seniors Mike Holloway and Darnell Edge were a part of it for the second time. Wagner was up against an offensive juggernaut, but if anyone could quell FDU’s attack it would be defensive mistro Bashir Mason, right? The start of the game were promising enough for Mason’s Seahawks. Two triples by Romone Saunders and Elijah Davis and two empty possessions by FDU spotted Wagner a 6-0 lead more than 3:30 in. And then the fireworks started in Hackensack. What transpired was an offensive masterpiece – the Knights closed the first half out with 43 points on their next 23 possession for an absurd 1.87 points per possession. In those 23 possessions, the Knights came up empty just four times, while scoring in their final seven times down the court. When the dust settled, Wagner didn’t know what hit them, trailing 43-14. Five Knights scored in double figures led by NEC all-conference second teamer Holloway and his 18 points on 7 shots. The ever versatile Elyjah Williams had 17, while sharpshooter Darnell Edge “only” contributed with 15. Jahlil Jenkins was his heady floor general self, dishing out six assists versus just one turnover. How he didn’t make an all-conference team is beyond me, but I digress. Greg Herenda now possesses a career record of 5-3 in the NEC tournament, including a perfect 3-0 mark at home. That flawless record at the Rothman Center will be tested with Andy Toole and the defensive minded Colonials coming to town. Does Matty McConnell guard Darnell Edge? Who do you match up on the suddenly resurgent Holloway? What is Toole’s game plan for keeping Jenkins in front of his defenders? This is a special offensive unit. Coming into tonight, the Terriers haven’t been good on the road (3-6 in NEC play) whereas the Colonials have taken well to the cozy NAC gym with a 7-2 mark against conference foes. Andy Toole had bested Glenn Braica twice this season, and has gone 7-2 at home in the NEC tournament. Conversely, Braica is 2-7 in the conference playoffs with his only two victories coming during the Terriers magical 23-win season in 2014-15. Want more kindling on the fire? The best defense in the NEC is a perfect 11-0 in league play when they hold their opponents to under 65 points or less. St. Francis Brooklyn could only muster 0.88 points per possession in their two losses (49 and 62 points, respectively) to their Pennsylvania rival. Throw in a 400 mile trip from Brooklyn to Moon Township and all signs point toward an easy victory for the hosting Colonials. Right? At that point in the contest, the Terriers held a 55-47 lead with 4 minutes remaining. KenPom gave them a 95% chance to pull out it out and would have given the program their first NEC tournament victory since their memorable 2014-15 campaign. But then, Matty McConnell happened. McConnell was awesome in what could’ve been his final game as a Colonial – he finished with 21 points, 7 rebounds, 3 steals and 2 blocks (!) in what turned out to be an overtime victory. But it was also the Colonials defense that kept them alive in regulation, holding the Terriers to one point in their final 7 possessions in regulation. Malik Petteway, the modern day Chris Wray, put his stamp on the defensive effort. The defense continued the momentum into the overtime, holding the shellshocked Terriers to one 3-pointer in five possessions. By then, the Colonials had a lead they wouldn’t relinquish. It was a phenomenal comeback led by McConnell and, surprise suprise, an Andy Toole coached defense. The victory was Toole’s 13th NEC tournament win against seven defeats. It’s not easy having a bullseye on your back. Saint Francis University learned that lesson the hard way in last season’s NEC tournament when the 7-seeded FDU Knights upset the 2-seeded Red Flash in Loretto. In a similar situation yesterday, Rob Krimmel’s team jumped out to a comfortable 18-point lead at the half on the visiting Bryant Bulldogs. One sluggish second half later and the Red Flash survived with a 4-point victory. It wasn’t pretty in that second stanza, but like Mount St. Mary’s (over Sacred Heart by 3 points in 2017 NECT QF) and Fairfield Dickinson (over SFU by 2 points in the 2016 NEC QF) before them, all you have to do is survive and advance. And that’s exactly what the kids from Loretto did. They may have only scored 1.03 ppp against the league’s worst defense from an efficiency standpoint, but the name of the game is to win. The big four of SFU – Keith Braxton, Isaiah Blackmon, Jamaal King and Andre Wolford – combined for 54 of the team’s 67 points. They’ll be tested on Saturday when the defending NECT champions come to town having won 5 of their last 6. The road to a NEC tournament championship is never easy. For my final post before the NEC regular season ends, I felt like talking about a myriad of topics. There’s really no theme here, other than the Q&A I’m about to engage myself in. What do we know going into the final week? Well, it’s looking like my over/under prediction will wind up short, but not by much. First one to 11 NEC wins gets the conference? Or perhaps the fairer question is over/under 11.5 wins to get at least a share of the reg season title? Going back another five years, you’ll find the last time a team finished in first place with 12 wins. Both Monmouth and St. Francis Brooklyn in 2003-04 were tied atop the standings at season’s end with a 12-6 conference record. Will we see this happen again by the end of Saturday’s set of games? According to KenPom, Saint Francis has a 44% and 36% chance to win at Wagner and Sacred Heart, respectively. For the Red Flash to sweep their final two contests, the odds drop to 16%. The good news for Rob Krimmel’s group is being on the road hasn’t been a detriment to Saint Francis’ success of late; they’ve won five of their last seven outside of their friendly confines. As for the rest of the league’s odds, I highly recommend diving into Ron Ratner’s weekly update. Some of the teams still have a wide range of outcomes; for example, Sacred Heart can finish anywhere from first all the way to seventh depending on what goes down this weekend. LIU Brooklyn could possibly host a NEC tournament playoff game (#4 seed) or not make the tournament all together. Who’s the next NEC Jim Phelan Coach of the Year? I honestly don’t know, and can’t confidently answer this with an educated guess until the regular season is finished. For me, there are four legitimate candidates at the moment. And their chances all hinge on the regular season results for the final week. Rob Krimmel, Saint Francis U – The 7-year head coach and long-time NEC participant would’ve been the logical choice for the award had the Red Flash kept their winning streak alive last Saturday against the Blackbirds. But in NEC fashion, LIU Brooklyn was powered behind 35 points from Ty Flowers and Raiquan Clark to pull off the upset in Loretto. Now, the Red Flash must win the league title the hard way, on the road against two programs looking to finish in the top four. If the Red Flash can claim the championship outright, it will be hard to keep Krimmel from earning his first ever COY honor, even though the Red Flash were expected to be at the top during preseason prognostications back in the fall. That didn’t stop the coaches from voting for Glenn Braica after the Terriers’ 15-3 masterpiece in 2014-15. Greg Herenda, Fairleigh Dickinson – Like Krimmel’s squad, many pundits expected FDU to be at or near the top by late February. A 9-2 run after a 1-4 start has put them in a good position – they’re hosting at least one NEC tournament game at worse – with winnable games at the Mount and Central Connecticut looming. If the Knights sweep the mini road stand and acquire a share of the NEC regular season title, I’d have no qualms if the COY is awarded to Herenda. Anthony Latina, Sacred Heart – The Pioneers were picked ninth in the NEC Coach’s Preseason Poll, so Sacred Heart’s overachieving relative to their expectations would play a huge role in Latina winning the COY award. His team needs to finish strong at the very least. A sweep against Saint Francis and Robert Morris – two programs he’s a combined 0-10 against over the past three seasons – would guarantee at least one home playoff game, if not possibly more. Finishing with a 10-8 or 11-7 regular season is fairly impressive given they are the 298th most experienced roster in Division I and rely on three freshman, one sophomore and one Division II transfer. Andy Toole, Robert Morris – We can’t forget about the league’s 2013-14 COY recipient, who currently has an opportunity to earn his third regular season championship in nine tries. Despite experiencing a crazy amount of turnover the past few seasons, Robert Morris has routinely been a defensive juggernaut with this season as no exception. At 10-6, Toole has engineered an impressive return to the top third of the standings despite losing Koby Thomas for much of the season. The Colonials have forced a turnover on 22.5% of their opponent’s possessions, good for 22nd in Division I basketball. This is the fifth straight year the program has been in the top 30 – that’s remarkable consistency with the roster fluctuations. So who’s going to be the next NEC Defensive Player of the Year? Matty McConnell, Robert Morris – The heart and soul of Robert Morris defense has that infectious energy about him when in a defensive stance. He’s the best perimeter defender on the league’s number one defense (at least according to defensively efficiency numbers) and possesses a steal rate that’s in the NCAA top 100 at 3.4%. Malik Petteway, Robert Morris – Speaking of steal rate, Petteway actually leads the league in that category as well as sporting the eighth best block rate. His Chris Wray like ability to affect the game a multitude of ways has guided the Colonials. Jare’l Spellman, Sacred Heart – The 6-foot-10 center came as advertised from Florida Southern as a former defensive player of the year. Spellman’s 89 blocks leads the conference by a country mile and he has an opportunity to become the first NEC player since 1996-97 (Richard Lugo, St. Francis Brooklyn) to accumulate at least 100 rejections in a campaign. His rim impact is a major reason why Sacred Heart is in the upper half of the league in defensive efficiency. Juan Cardenas, Bryant – Whether it’s tough man-to-man defense or providing help when an opponent infiltrating the paint, Cardenas has been a master at blocking or altering shots around the rim. His game changing length, versatility and lateral quickness has led to 8.4% block rate, good for 84th in the country. Randall Gaskins, Saint Francis – Gaskins is perceived to be one of the best perimeter defenders in the league, serving as a very useful “3 and D” type of complement to Krimmel’s assortment of play-makers. While I view him as a long shot to win the DPOY, his name deserves mentioning here nonetheless. What has surprised you this season? E.J. Anosike and Jarel Spellman are the best two-man frontcourt duo in total putbacks. They have 72 combined putbacks, greatly exceeding any other NEC duo. After graduating a very good frontcourt in its own right with Matasovic, Lopez and Barnett, Anosike, Spellman and LaRose have put together one of the best big man rotations in the NEC. I don’t think anyone saw that coming. This shouldn’t be much of a surprise, but I’m still impressed by the Mount’s resolve this season. The second youngest roster in the nation has now boasted five freshmen who’ve been selected at one point as NEC freshmen of the week (Vado Morse, Dee Barnes, Malik Jefferson, Nana Opoku and now Damian Chong Qui). Dan Engelstad’s group may have been eliminated from qualifying for the NEC tournament, yet the Mountaineers have been very respectable over the past several weeks, knocking off Sacred Heart, Wagner and Robert Morris. They surely will emerge as a trendy sleeper next season. Everyone will be back! Bryant has turned into one of the slower NEC programs with respect to tempo. The Bulldogs are sixth among their counterparts at 68 possessions per game. That’s not a snail’s pace, but it’s not Iona racing down the floor either. In the preseason, Grasso expected his team would mimic the Gaels model, a model that was consistently in the top 60 nationally in KenPom’s adjusted tempo. At NEC Social Media Day, however, Grasso did add in the caveat that they “have to get guys to understand how to play with pace all the time.” He further explained that it takes time to program your team to get in that mindset of fast pace day in and day out. Clearly, Grasso had enough time to evaluate his talent and understand that a fast tempo wasn’t conducive to winning. In games where the pace gets at 70 possessions or more, the Bulldogs are 1-11 (1-4 NEC) whereas they are 9-6 when a slower tempo is implemented. Running much of the offense through Bash Townes, who thrives in pick and roll situations and isn’t exactly none as a rim runner, also likely plays a role in Grasso slowing down the team’s pace of play. Raul Frias (125 ORtg), Eral Penn (124 ORtg) and Ty Flowers (118 ORtg) lead the Blackbirds in offensive efficiency during league play. I know, right?! I talked about Frias’ improvement last week, yet Flowers has really emerged as LIU Brooklyn’s x-factor. Over the last six games, Flowers has been deemed the KenPom MVP four times, averaging 20.3 points, 6.0 rebounds, 4 blocks and 1.8 steals in those situations. Not surprisingly, LIU Brooklyn is 3-1 when the Waterbury, Connecticut native breaks out. For Penn, the sophomore’s tenacity around the rim on both ends has caused havoc. He’s currently second among league mates in 2-point field goal percentage (66.7%), fourth in block rate (8.6%) and eighth in offensive rebounding rate (10.3%). That’s all I have for now. Enjoy the action this weekend. 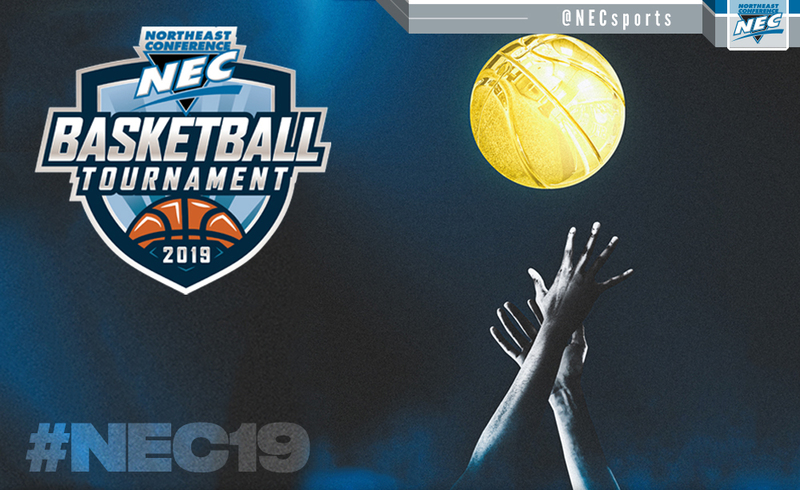 The NEC tournament is nearly upon us!